29 ноября - 29 декабря 2015 г.
В 12 Арктических реках, расположенных в различных районах Кольского полуострова и прилегающих арктических территорий из 53 образцов перифитона, собранных в период 2007-2010гг., было выявлено 149 видов и разновидностей водорослей и цианобактерий из 7 таксономических отделов. Показатели среды также приводятся. Ключевые слова: Арктические озера; перифитон; качество воды; Кольский полуостров; Россия. The Russian Arctic region is represent by stressed environment with long winters, constant low temperatures, extremes of irradiance and short vegetation period. That because is very important for study of algal communities in stressed environment. The algal diversity research in the Arctic region of European Russia are less advanced than in Canada (Michelutti et al., 2003), Greenland (Cremer et al., 2005a), and Asian Arctic (Cremer et al., 2005b; Kharitonov, 1993, 2010). At this initial stage we (Barinova, Stenina 2013; Denisov, 2007, 2008a,b; Denisov, Kashulin, 2007; Kashulin et al., 2008), our Russian (Stenina, Patova, 2000; Stenina 2005a,b,c, 2009) and Finnish (Ylikörkkö et al., 2015) colleagues are earlier focused on the European Russia Arctic lakes diatom diversity of which was formed under strong climatic as well as variable anthropogenic impacts. Nevertheless, the riverine communities and water quality can be very important study for monitoring and assessment of anthropogenic impacts in the Arctic sensitive environment. Our recent studies is more consistently related to basis for bio-indication of the rivers ecological status, pollution impacts, and self-purification capacities, assessed according to the European Water Framework Directive (The Directive 2000) that emphasizes the importance of algal communities as the most informative component of the large rivers ecosystem (Reynolds & Descy 1996). The present work was aimed at inventory of algal diversity in the Kola Peninsula rivers and its environmental variables. We intended to reveal trends of algal diversity under high-latitude climatic impacts which combined with anthropogenic impact on the some river basins. Our study area (Figure 1) is combined natural territories and falling under strong anthropogenic impact. Freshwater ecosystems of the Kola Peninsula and adjacent territories of Fennoscandia in the Murmansk region are characterized by specificity of the conditions of water quality formation, due to the peculiarities of the complex landscape and geographical factors and the dynamics of the climate system. In Figure 1 we are outlined the major river basins in the peninsula and here can be seen where each river is placed. Typical for these rivers are natural origin, ultrafresh, ultraoligotrophic with high transparency at the water sources and industrially impacted at its lower parts (Kashulin et al., 2008). Over the past 70-100 years of intensive industrial development and the development of social and transport infrastructure, water ecosystems of the Kola Subarctic undergone significant changes in the level of structural and functional organization (Kashulin et al., 2008). The most largest and important lake-river systems in the Kola Peninsula are the Imandra Lake that now is under impact of Kola Nuclear Station, industrial complexes OJSC «Apatite» and «Severonickel Combine» (Norilsk Nickel) of Kola Mining-Metallurgical Company as well as the Pasvik River system that is under impact of the «Kovdorsky Mining and Processing Plant», OJSC, «Kovdorslyuda», Pechenganikel, and Olenegorsky Mining and Processing Plant. Special attention was paid to aquatic ecosystems are experiencing long-term human impact, including persistent objects integrated to the rivers environmental monitoring. Fig. 1. Sampling sites of 12 studied river basins on the map of the Kola Peninsula and adjusted Murmansk region. White points – numbers of river basins as in Appendix 1. Blue lines – our outlining of catchment basins; toned – ecoregions (according Kalabin et al., 1999). We studied 53 samples of periphyton collected in 2007-2010 from 12 rivers placed in different regions of the Kola Peninsula and Murmansk region. Periphyton samples were taken from few sampling stations over each river with scratching from the boulder surface and partly fixed in 4% neutral formaldehyde solution. Non fixed and fixed samples were transported to the lab in the ice box, and investigated in soft and permanent slides under microscopes «Leitz Biomed», Motic BA 300 and «Carl Zeiss Jena NU 2E» at 400-1000x with the help of international guides (Dedussenko-Schegoleva, Hollerbach, 1962; Hollerbach et al., 1953; Komárek, Anagnostidis, 2001; 2005; Komarenko, Vasilieva, 1978; Krammer, Lange-Bertalot, 1986; 1988; 1991а; 1991b; Moshkova, Hollerbach, 1986; Proshkina-Lavrenko, 1974; Tikkanen, 1986) and current taxonomic literature. The list of identified species was arranged alphabetically according to modern taxonomy cited in Guiry and Guiry (2015). Water samples for hydrochemistry were taken in parallel with algal samples and analyzed in the Analytical Laboratory of the Institute of Ecology, Kola Scientific Center of Russian Academy of Science with standard methods (Kashulin et al., 2008; Standard method…, 1975; Strickland, Parsons, 1972). The ecological characteristics of the revealed species were obtained from the database compiled for freshwater algae from multiple analyses of algal biodiversity (Barinova et al., 2006) with additions (Bahls et al., 1984; Dell'Uomo, Torrisi, 2011; Kharitonov, 2010; Odland, Norway, 2005; Pankow, 1976; Salden, 1978; Soininen et al., 2004; Sreenivasa, Duthie, 1973; Ter Braak, Van Dam, 1989; Van Dam et al., 1994; Van de Vijver et al., 2004; Wåhlin, 1970; Whitmore, 1989) according to substrate preference, temperature, streaming and oxygenation, pH, salinity, organic enrichments, N-uptake metabolism, and trophic states. As can be seen in Appendix 1 (lakes are sorted by its latitude from south to north), the Kola Peninsula Arctic rivers are shallow with depth from 0,1 to 2,5 m, and catchment area from 0.22 (Zhelezny stream) to 507 km2 (Tsaga River). The largest river Tsaga and Belaya are placed in the south-west and central part of peninsula. Studied rivers are of low temperature, salinity and mostly circumneutral pH. The river water active protons concentration (pH) were below 7.0 in the northern and southern rivers catchment basins of which are placed close to industrial pollution areas (Figure 1). In contrary, the rivers in central part of peninsula have pH above 8.0 such as Yuksporrjok River and Zhelezny stream. Its water is rather enriched by nutrients in contrary to southernmost and northernmost rivers (Appendix 1), but silica is presents. Nutrients are increased in the river sites which are placed near the Mining and Processing Plants and correlated with pH increasing. We found 149 species and infraspecies of algae and cyanobacteria from 7 taxonomic divisions in 12 Arctic rivers of the Kola Peninsula (Appendix 2). Bacillariophyta was strongly prevailed, with followed Chlorophyta and Cyanobacteria (Appendix 3). 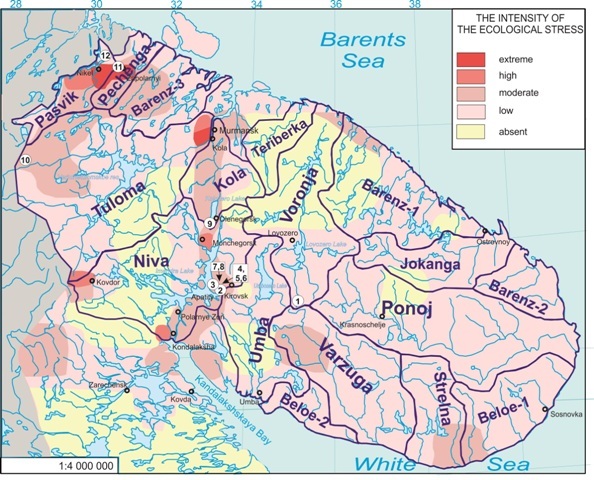 Species richness fluctuated from 7 species in the southernmost Tsaga River to 51 in the Saamka River (including inflows) placed in the western part of the Kola Peninsula. Taxonomic composition in the riverine communities fluctuated from on behalf contain of diatom algae and cyanobacteria in the southern basins of peninsula till enriched by diatoms up to 80% in the northern rivers (basins 6-12). Only the Zhemchuzhnaya River community was represented by diatoms. Over the diatoms, up to 20-40% of cyanobacteria species was found in the rivers of southern and central part of peninsula – Tsaga, Belaya, Yuksporrjok, Saamka, and Zhelezny stream. Despite the fact that algae from other taxonomic divisions were diverse, they all are representing not more than 15% of the studied riverine communities. Remarkably, the species richness as a whole is different on the northern and southern part of peninsula. The most species rich communities were found in the rivers Belaya and Saamka, catchment basins of which are close related with major pollution sources (Figure 1). Our results show that high algal diversity over the broad range of environmental variables evidenced that the algal species being well adapted to the Arctic rivers habitats are survived in the natural and anthropogenic environment of the Russian European Arctic. This work has been partly funded by the Israel Ministry of Absorption. 1. Bahls L.L., Weber E.E., Jarvie J.O. Ecology and distribution of major diatom ecotypes in the Southern Fort Union coal region in Montana // Geological Survey Professional Paper. 1984. Vol. 1289. P. 1–151. 2. Barinova S., Stenina A. Ecological adaptation of diatoms in the Arctic lakes of the Kostyanoi Nos Cape (Nenezky Natural Reserve, Russian North) // Plant Biosystems. 2013. Vol. 147, № 2. P. 397–410. 3. Barinova S.S., Medvedeva L.A., Anissimova O.V. Diversity of algal indicators in environmental assessment. – Tel Aviv: Pilies Studio, 2006. – 496 p. (In Russian). 4. Cremer H., Bennike O., Kansson L.H., Hultzsch N., Klug M., Kobabe S., Wagner B. Hydrology and Diatom Phytoplankton of High Arctic Lakes and Ponds on Store Koldewey, Northeast Greenland // International Review Hydrobiology. 2005a. Vol. 90, № 1. P. 84–99. 5. Cremer H., Wagner B., Juschus O., Melles M. A microscopical study of diatom phytoplankton in deep crater Lake El’gygytgyn, Northeast Siberia // Algological Studies. 2005b. Vol. 116. P. 147–169. 6. Dedussenko-Schegoleva N.T., Hollerbach M.M. Golden-green algae. Freshwater algae guide of USSR, 5. – Moscow-Leningrad: Nauka, 1962. – 272 p.
7. Dell'Uomo A., Torrisi M. The Eutrophication/Pollution Index-Diatom based (EPI-D) and three new related indices for monitoring rivers: The case study of the river Potenza (the Marches, Italy) // Plant Biosystems. 2011. Vol. 145, № 2. P. 331–341. 8. Denisov D.B. Changes hydrochemical composition and diatom flora of sediments in the zone of influence of mining production (Kola Peninsula) // Water Resources. 2007. Vol. 34, № 6. P. 719-730. 9. Denisov D.B. Mountain polar lakes development under polytypic environmental changes // Polar research – Arctic and Antarctic perspectives in the International Polar Year. Open science conference. (St. Perersburg, Russia, 8-11 July 2015). – St. Perersburg, 2008a. – P. 208. 10. Denisov D.B. The dynamics of algal communities of mountain subarctic waters // Ecological problems of the northern regions and their solutions: Proceedings of International Conference. Apatity, Kola Scientific Center RAS Press. – 2008b. – Vol. I. – P. 205-210. 11. Denisov D.B., Kashulin N.A. 2007. Environmental features of the functioning of different types of sub-arctic waters. URL: http://www.kolasc.net.ru/russian/sever07/sever07_1.pdf (access: 04.09.2015). 12. Duff K.E., Laing T.E., Smol J.P., Lean D.R.S. Limnological characteristics of lakes located across arctic treeline in northern Russia // Hydrobiologia. 1999. Vol. 391. P. 205–222. 13. Guiry M.D., Guiry G.M. AlgaeBase. 2015. World-wide electronic publication, National University of Ireland, Galway. URL: http://www.algaebase.org (access: 04.09.2015). 14. Hollerbach M.M., Kossinskaya E.K., Polyansky V.I. Cyanophyte algae. Freshwater algae guide of USSR, 2. – Moscow: Sovietskaya Nauka Press, 1953. – 654 p.
15. Kalabin G.V. Makarova T.D., Tikunov V.S. (Eds.). Ecological atlas of the Murmansk District. – Moscow-Appatity: The Institute of North Industrial Ecology, Kola Scientific Center RAS Press, 1999. – 48 p.
16. Kashulin N.A., Denisov D.B., Sandimirov S.S., Dauwalter V.A., Kashulina T.G., Malinovsky D.N., Vandysh O.I., Ilyashuk B.P., Kudryavtseva L.P. The anthropogenic changes of aquatic systems of the Khibiny massif (Murmansk region). Vol. 1. – Apatity: Kola Scientific Center RAS Press, 2008. – 244 p.
17. Kharitonov V.G. Summary of Diatom (Bacillariophyceae) flora of the Northern coast of the Okhotsk Sea. – Magadan: Institute of Biological Problems of the North Press, 2010. – 189 p. (In Russian). 18. Kharitonov V.G. To flora of diatom algae of lake El’gygytgyn // Belyy V.F., Chereshnev I.A. (eds.). The nature of a hollow of the El’gygytgyn Lake. – Magadan: Institute of Biological Problems of the North, Far-East Branch of the Russian Academy of Science Press, 1993. – P. 95–104. (In Russian). 19. Komárek J., Anagnostidis K. Cyanoprokaryota, Teil 1: Chroococcales. Süßwasserflora von Mitteleuropa, 19/1. – Jena, Stuttgart, Lübeck, Ulm: G. Fischer, 1998. – 548 p.
20. Komárek J., Anagnostidis K. Cyanoprokaryota, Teil 2: Oscillatoriales. Süsswasserflora von Mitteleuropa, 19/2. – München: Elsevier, 2005. – 759 p.
21. Komarenko L.E., Vassilieva I.I. Freshwater green algae of the Yakutia waterbodies. – Moscow: Nauka, 1978. – 284 p.
22. Krammer K., Large-Bertalot H. Bacillariophyceae. 3: Centrales, Fragilariaceae, Eunotiaceae. Bd. 2/3. – Stuttgart, Jena: Fischer, 1991a. – 563 p.
23. Krammer K., Large-Bertalot H. Bacillariophyceae. Teil 1: Naviculaceae. Süsswasserflora von Mitteleuropa, Band 2/1. – Stuttgart: Fischer, 1986. – 876 p.
24. Krammer K., Large-Bertalot H. Bacillariophyceae. Teil 2: Bacillariophyceae, Epithemiaceae, Surirellaceae. Süsswasserflora von Mitteleuropa, Band 2/2. – Stuttgart: Fischer, 1988. – 596 p.
25. Krammer K., Large-Bertalot H. Bacillariophyceae. Teil 4: Achnanthaceae. Süsswasserflora von Mitteleuropa, Band 2/4. – Stuttgart, Jena: Fischer, 1991b. – 437 p.
26. Michelutti N., Douglas M.S.V., Smol J.P. Diatom response to recent climatic change in a high arctic lake (Char Lake, Cornwallis Island, Nunavut) // Global and Planetary Change. 2003. Vol. 38. P. 257–271. 27. Moshkova N.A., Hollerbach M.M. Green algae. Class Ulotrichophyceae (1). Order Ulotrichales. Freshwater algae guide of USSR, 10(1). – Leningrad: Nauka, 1986. – 360 p.
28. Odland A., Norway B. Oligotrophic and mesotrophic vegetation in southern Scandinavian mountains // Phytocoenologia. Vol. 35, № 4. 2005. P. 985–1018. 29. Pankow H. Algenflora der Ostsee. 11. Plankton. – Jena: VEB Gustav Fischer Verlag, 1976. – 493 p.
30. Proshkina-Lavrenko A.I. (ed.). Diatom algae of the USSR (recent and living). Vol 1. – Leningrad: Nauka Press, 1974. – 403 p.
31. Reynolds C.S., Descy J-P. The production, biomass and structure of phytoplankton in large rivers // Arch. Hydrobiol. Beih. 1996. Vol. 113, Large Rivers 10. P. 161-187. 32. Rühland K.M., Smol J.P., Wang X., Muir D.C.G. Limnological characteristics of 56 lakes in the Central Canadian Arctic Treeline Region // Journal of Limnology. 2003. Vol. 62, № 1. P. 9–27. 33. Salden N. Beiträge zur Ökologie der Diatomeen (Bacillariophyceae) des Süßwasserser. – Bonn: Decheniana Bh., 1978. – Vol. 22. – 238 p.
34. Sreenivasa M.R., Duthie H.G. Diatom flora of the Grand River, Ontario, Canada // Hydrobiologia. 1973. Vol. 42, № 2–3. P. 161–224. 35. Standard methods for examination for water and wastewater. – NY: USA, 1975. – 1195 p.
36. Stenina A.S. Diatom algae (Bacillariophyta) of plankton in the lakes of the Chabuyka River basin (Nenetsky Reserve) // News of systematics of the lower plants. 2009. Vol. 43. P. 82–98. (In Russian). 37. Stenina A.S. Diatom algae in plankton of the Kostyanoi Nos Cape (Nenetsky Reserve) // Botanical Journal, St-Petersburg. 2005a. Vol. 90, № 5. P. 669–681. (In Russian). 38. Stenina A.S. The first data about Bacillariophyta diversity in water bodies of Neruta River basin (Malozemel’skaya Tundra). // Biodiversity of terrestrial and aquatic ecosystems of the Malozemel’skaya Tundra reserves and adjacent territories: Proceedings of the Komi Scientific Center. – Syktyvkar: Komi Scientific Center Press. – 2005c. – Vol. 176. – P. 5–20. (In Russian). 39. Stenina A.S. The first data about Bacillariophyta in phytoplankton of water bodies of the Russkiy Zavorot Cape (Nenetsky Reserve) // News of systematics of the lower plants. 2005b. Vol. 39. P. 99–109. (In Russian). 40. Stenina A.S., Patova E.N. Noordhuis. Phytoplankton // Van Eerden M.R. (ed.). Pechora Delta. Structure and dynamics of the Pechora Delta ecosystems (1995–1999). RIZA report number 2000.037. – Lelystad: RIZA Institute for Inland Water Management, The Netherlands, – 2000. – P. 99–113, 289–308. 41. Strickland J.D.H., Parsons T.R. A Practical Handbook of Seawater Analysis // Bull. Fish. Res. Bd. Canada. 1972. Vol. 167. P. 1-311. 42. Ter Braak C.J.F., Van Dam H. Inferring pH from diatoms: a comparison of old and new calibration methods // Hydrobiologia. 1989. Vol. 178. P. 209–223. 43. The Directive 2000/60/EP of the European Parliament and of the Council establishing a framework for community action in the field of water policy. – OJL 327. 44. Tikkanen T. Kasviplanktonopas. – Helsinki: Suomen Luonnonsuojelum Tuki Oy, Forssa, 1986. –278 p. (in Finnish). 45. Van Dam H., Martens A., Sinkeldam J. A coded checklist and ecological indicator values of freshwater diatoms from the Netherlands // Netherlands Journal Aquatic Ecology. 1994. Vol. 28, № 1. P. 117–133. 46. Van de Vijver B., Beyens L., Lange-Bertalot H. The genus Stauroneis in Arctic and Antarctic Regions // Bibliotheca Diatomologica. 2004. Vol. 50. P. 1–317. 47. Wåhlin I. Die Diatomeen des Latnjajaure. I. Die rezenten Bodendiatomeen // Archiv für Hydrobiologie. 1970. Vol. 67. P. 460–484. 48. Whitmore T.J. Florida diatom assemblages as indicators of trophic state and pH // Limnology and Oceanography. 1989. Vol. 34, № 5. P. 882–895. 49. Ylikörkkö J, Christensen G.N., Kashulin N., Denisov D., Andersen H.J., Jelkänen E. Environmental Challenges in the Joint Border Area // Reports 41. Centre for Economic Development, Transport and the Environment for Lapland. – Kokkola: Juvenes Print, 2015. – 165 p.
Altogether 149 species and infraspecies of algae and cyanobacteria from 7 taxonomic divisions has been revealed in 53 samples of periphyton collected in 2007-2010 from 12 rivers placed in different regions of the Kola Peninsula and adjusted territories of Russian Arctic. Environmental variables are also given. Key words: Arctic rivers; Periphyton; Water quality; Kola Peninsula; Russia. Денисов Дмитрий Борисович - Denisov Dmitry B.
Баринова София Степановна - Barinova Sophia S.
Уважаемые коллеги! Если Вы хотите получить версию статьи в формате PDF, пожалуйста, напишите в редакцию, и мы ее вам с удовольствием пришлем бесплатно. Эл N ФС 77-22222 от 01 ноября 2005г.